All of miniLand's lights. Are extremely simple to operate, with an on/off switch at the base. Are super bright with a soft natural light. Do not require any wiring or plugs! Have a built-in Lithium watch battery (CR1632). Our lights are designed for 1:12 and 1:6 scales (sizes specified in the product title). All ceiling and wall lights attach with a miniature disk magnet, which comes included with the lights. Video will open in a new window. Lighting your dollhouse is extremely simple with our battery operated lighting system. Each light comes with its own battery and all you need to do is simply turn a switch on/off on the base of the light. The base where the battery fits unscrews so batteries can be replaced easily and as needed. Wall and ceiling lights also come with a magnet. Simply glue the magnet in the spot you wish to have your light, and the light piece will attach to the magnet with ease. There is no need for the complexity of electrical tape and wiring. Power sources for a single light powered using a batteries box. Power sources for several lights powered using a batteries box. Power sources for several lights powered from an outlet. 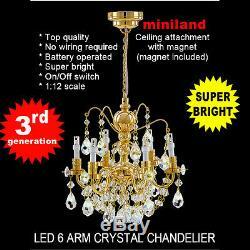 External adapter kit for LED 3G battery operated miniland dollhouse miniature lights - YouTube. DIY - instruction for external operation for multiple LED dollhouse miniatures lights - YouTube. If you would like to create a high-end finish for your chandelier, take a look at our beautiful, handmade ceiling medallions. Please note that all of miniLand's products contain small parts and are not suitable for children under 12. Q: I can't find the magnet that comes with the light? A: The magnet is attached to the base of the lamp. Looks for a small metallic disk in the center of the base of the lamp. Please note that only ceiling and wall lights come with magnets. Floor and tables lights can stand on their base and do not require a magnet. Q: How should I glue the magnet to the wall? A: We recommend using a 2 part clear epoxy for this job. You can use any other good quality glue that can glue metal to wood. We do not recommend using a double tape adhesive, since it will loose its tackiness after a short time and cause the magnet and lights to fall. Q: How long does the battery last? A: A new battery can last up to approximately 50 hours with a single LED light. The battery life will be shorter if there are multiple lights. Q: My light is flicking, what should I do? A: This is usually caused by a loose connection with the battery. Remove the battery and clean it with a dry cloth before placing it back. If this happens to a lamp with a candle type lights, tighten the candle like a screw. You can also try switching the location of the candles. 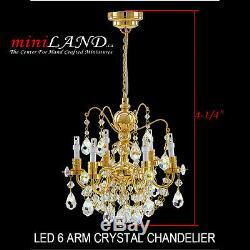 The item "Brass Crystal Chandelier 6arms battery LED LAMP Dollhouse miniature light swich" is in sale since Wednesday, July 26, 2017. This item is in the category "Dolls & Bears\Dollhouse Miniatures\Lamps & Lighting". The seller is "miniland_ca" and is located in Victoria, British Columbia. This item can be shipped worldwide.